I have been working on the family tree and ancestral healing since 2007. I have uncovered some of our family history, shared it with my family, kept note of who is who and visited all of the graves. My great grandfather, James Keena married twice. There are still people alive, including my own parents, who knew his second wife, who happened to be my grandmother’s sister and her married name was Mary Keena, just like my birth name! One day while in the graveyard with my second cousin, I was reminded of our great grandmother, the first wife and the role she played in our family. I vowed to find her grave and hoped to find it before her anniversary. This would be the last piece of family history I would work on. Her name was Christina Donlon and they got married in Athlone, Co Westmeath. 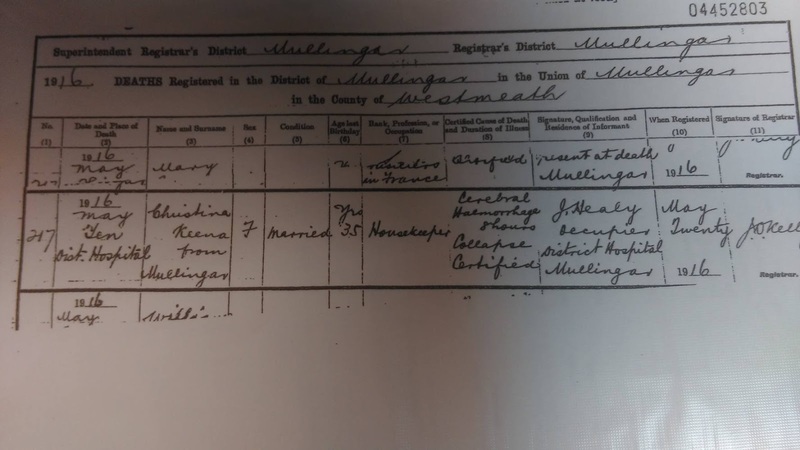 They lived in Cavan for the 1901 census and in Mullingar for the 1911 census. They had 9 children. She died at the age of 35 from a cerebral haemorrhage in Mullingar General Hospital on May 10th 1916. I also have her death cert. A few years ago a friend of mine who works helping people trace their roots, had helped me find some of the above information. At that time she checked with the graveyard in Mullingar (Ballyglass) for information on the graves there. Much of the paperwork had been lost in a fire so there was no information to be found about my great grandmother. I don’t know what prompted me, but I decided to check out the graveyards around Athlone, just in case she was buried with her own family. That wasn’t unusual in those times. About a month ago I went off on my day trip to Drum graveyard and found a very helpful man there. She wasn’t to be found there though. He even went into the records of either the marriages or her birth, I cannot remember, and there was a big message on a page in the book to say that the records weren’t available for an expanse of time, which included the date we were looking for!! From there he sent me to the church in Athlone town, St Mary’s. 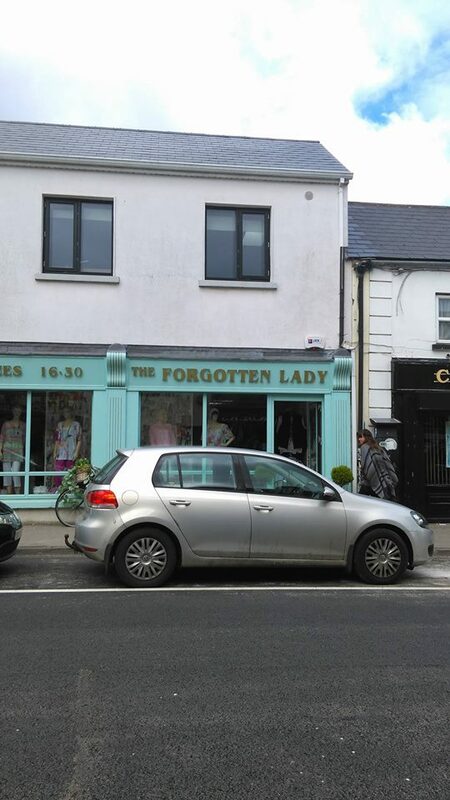 As I walked to the church I spotted a shop called The Forgotten Lady. I thought to myself “how appropriate”. Once again at the office of that church, I met some lovely people who sent me to a graveyard outside town where I met another lovely man called Damian. He took out massive books of records but we didn’t find anything either. I was indeed very grateful and a bit stunned at how I was moving forward and that I was actually meeting people along the way. I had thought that I was just going to be walking around graveyards looking at headstones!! I went home thinking “well at least I know where she isn’t!” I wasn’t working on this every minute of every day. I just let my thoughts guide me when I felt curious to search for more. I went onto the internet to check out the newspapers for her obituary. I emailed the Westmeath Examiner and again got a lovely helpful reply and a link to access all of the newspapers online. I read through some of the papers of May 1916 and of course the Easter Rising was happening in Dublin. As Dublin was in turmoil and the national newspapers’ offices were in the city centre, the newspapers weren’t being printed! Another dead end. I just laughed at this stage. The next internet searches showed me that there was now a list of all the graves on computer in Ballyglass cemetery in Mullingar. Brilliant. I was excited. Yesterday I was visiting my parents and I stopped at the graveyard. There was no-one manning the office but there was a telephone number for contact. I received an answer and made an appointment for mid- afternoon. Because it was the day before her anniversary I was very excited, really believing that I would find her just in time!!! Unfortunately it wasn’t the case. She wasn’t on computer. I am writing this today to remember her. She was the mother of my grandfather and his 8 siblings. Without her, my father and his siblings wouldn’t have been born and neither would I or my siblings and cousins or my children either. So even though there is no headstone with her name on it, she was a very important person and deserves to be remembered. She achieved so much in her 35 years. Look at the legacy she left behind! Over the past few weeks the women who took part in the Easter Rising of 1916 have been remembered in ceremonies all across Ireland. They too were brave and important ladies. This is my little contribution to remember another wonderful and special lady of that time! I am going to light a candle and “have a chat” with her on this her 100th anniversary.